Serves: 4 people Difficulty ': Media Preparation time: 2 hours and 40 minutes INGREDIENTS 300g. corn flour 500gr. of cod 'already' softened 1 onion 3 tablespoons capers 1 bunch of parsley a few leaves of basil 1 cup dry white wine 2 anchovy fillets vegetable broth 5 tablespoons flour olive oil salt pepper ------ -------------------- PROCEDURE Wash the salt cod 'and dry. Remove skin and bones and cut it into pieces. In a saucepan, bring to boil a liter of salt water, throw in the flour, stirring with a whisk. Cook the polenta for 1 hour, stirring. Pour the polenta into molds greased with oil and leave them warm. Peel and chop the onion. Flour the pieces of cod 'and brown in a pan with five tablespoons of oil. Drain. In the same pan fry the onion with anchovies and capers. Put the pieces of cod fish 'in the casserole, sprinkle with the wine and let evaporate. Bake for 45 minutes, adding more broth. Add salt and pepper. 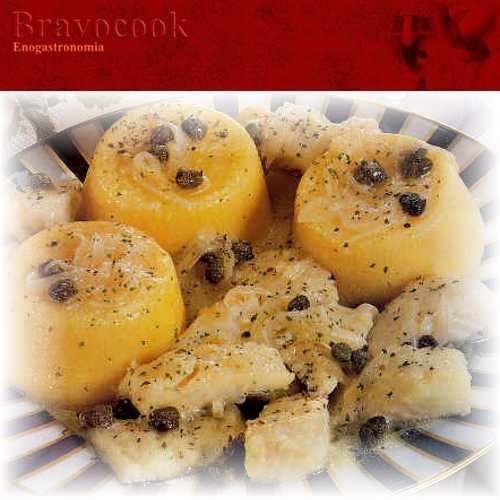 Turn out the puddings on a big plate of polenta with salt cod and contornateli '. Sprinkle with parsley and basil and serve.